Team collaboration has multiple territories. The territory of time tracking that entails project managers to track employee hours and monitor team accountability. Teams from various departments have varying patterns of functioning. For growing businesses, each day is a struggle. Teams endeavor to battle the rising competition, reduce project overheads and meet weekly goals to keep the boat afloat. Though such challenges of a workplace never entirely disappear, when individual minds come together and collate their brilliant set of skills, expertise, and ideas, the result is an inevitable increase in productivity and project success. Did you know that 86% of employees and executives associate lack of collaboration for workplace failures? However, in this fast-evolving digital era, with an independent culture of task performance, teams rely excessively on the best team collaboration software for day-to-day task functions. According to an Alfresco survey, nearly 83% of professional teams depend on technology to collaborate. For instance, interaction in marketing teams relies largely on sharing data, numbers and other kinds of information which is done via file sharing. Whereas, geographically dispersed teams rely on virtual meetings to discuss project progress. And this last one goes without saying, teams of all sorts, agile or non-agile need instant messaging platforms for minute-by-minute updates. To cater to all forms of online team collaboration, we devised a list of best team collaboration software for each category. The accelerating advances in cloud computing gave rise to the concept of online workspaces, which was most vigorously adopted by IT companies everywhere. Online workspaces obliterate the need to be physically present everywhere at all times. If anything, they allow project managers to be at two places at once. What more could a project manager ask for, right? You’ve probably never heard of nTask. Well, that’s okay, for it’s a brand-new project management tool that recently made its way into the market and is garnering great attention by working professionals from academia as well as thriving tech companies. nTask is aimed to help teams and project managers from all industries to help organize their projects and get work done faster. It eliminates user frustration, caused by overly-complex features. Everything in nTask, is designed with simple functionality, to help users stride their way from one part of the application another with minimum confusion. And to top it all: It is a multi-layered management tool that combines all your team collaboration needs under one roof. Create checklists within tasks, set task status and check task progress using automated progress meter. To manage repeating tasks, set task recurrence and get each task detail transferred within a matter of few seconds. The same technique applies for copying a task within a project. Project Managers can assess team performance by reviewing time reports sent for approval by each team member. No integrations needed! With the help of built-in spreadsheet feature, users can log total hours spent on each task, which are then generated into weekly timesheets by the application. With auto-generating Gantt Charts, teams can avail the luxury of gaining a quick perspective on all their task and project timelines. Gantt Chart view is accessible in a single click. Maintain project stability and complete projects within set deadlines by identifying issues and assigning them to specific resources for a focused solution. Every project is subjected to potential risks that can destroy project integrity. Safeguard your project lifecycle by creating, prioritizing and discerning the likelihood of each identified risk. Pro Plan – $2.99 per user per month. Unlimited everything. 7 powerful tools to manage work online and collaborate with your team members, absolutely free. If you’re a well-established enterprise with an inundating number of teams, rigorously working to meet impossible deadlines and tackling hard-to-impress clients, then Asana is the one of the top collaboration tools for your organization. Asana is one of the oldest project management tools, which explains the sophisticated level of workflow solutions that are to this day unparallel by any software out there. 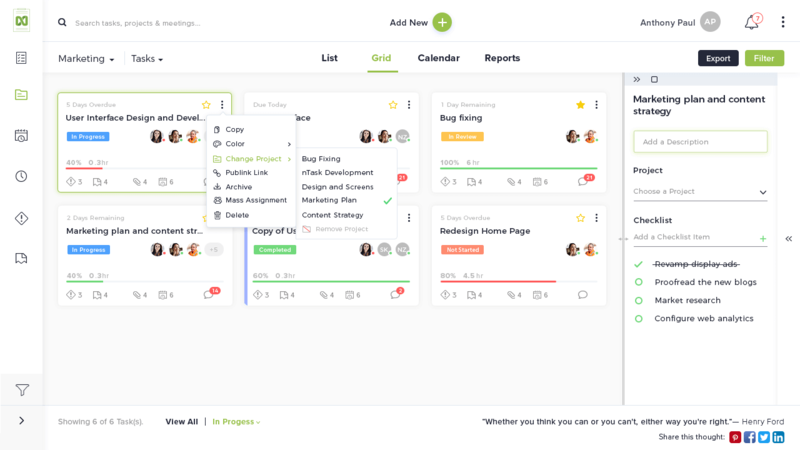 Visually creative Kanban boards to help manage and organize work into separate compartments with an easy drag-and-drop option. Basic Free Version – 15 members, unlimited tasks, projects, and conversations. Businesses with effective communication are 50% more likely to have a lower employee turnover. Not fairly old, but this one hardly needs an introduction. If your team doesn’t use Slack, then I’m certain you’ve at least heard about it. Slack provides a centralized hub for teams of all sizes to communicate in real-time. Carry out voice and video calls with as many as 15 people at a time. Free Plan – small teams. 5 GB file storage. Single Person Voice call. Standard Plan – $6.67 per user/month. Unlimited message search. 10 GB file storage per member. Voice & video call up to 15 members. Fleep is best recognized as a Slack Alternative. While it has too much in common with Slack, Fleep hits the mark with a handful more superior features to galvanize teamwork. Fleep is most enamored for its penchant to clear the hotchpotch of long disjointed emails that are both confusing and time-consuming. Integrates with Google Hangouts to facilitate audio and video call. This includes screen sharing for a more closer insight. Exclusive File Drawer option enables users to locate an image or file shared in a conversation at any given time in the past. Pinboard feature allows users to create digital sticky notes that can be pinned to the side of a conversation. Team members can collectively make changes to these pins that can most often be used as reminders, meeting updates or etc. Chat-experience enhancing features such as Writing indicator (that tell you when someone on the other end is typing), Seen indicators (that display read receipts) and Last Active (that reveal the time user was last available at). Native Task management feature that allows users to create, assign and manage tasks. Business Plan – 5 Euros per user/month. 100 GB File storage. My tasks. Upload your company name & logo. Premium conversations. According to Cisco, 37% of employee time is spent in meetings. While most meetings are a drag and a waste of time, we can’t deny what perpetual necessity meetings are for team collaboration. It is for this reason, Cisco WebEx, one of the most powerful meeting management software is included in this list. Schedule meetings using Quick or Advanced Scheduler. Users can send meeting invites via SMS, email or IM. In case of a dead battery or technical constraints, WebEx facilitates immediate device switch option in connection with meeting remains intact. Premium – $24/month. 8 members. Video conferencing and screen sharing. Flock has nearly the same features as Slack, but at less price. Although the interface of Flock can seem a bit cluttered at first, the tool comes with some solid team collaboration features. Get all your team members on the same page by creating distinct team channels, and collaborate through audio and video calls. Furthermore, keeping track of important messages in not a hassle anymore with Flock’s bookmarking feature. Add specific messages to your favorites, so you can access them anytime you want. The next team collaboration software we have in line is Yammer. A Microsoft powered tool, Yammer is a social networking platform which facilitates seamless communication within an organization. Providing users with a common place for brainstorming and sharing creative ideas, this team collaboration app helps companies make better decisions, faster. The ability to create public and private groups inside Yammer allows you to share files in one central location, without any fear of data loss. You can also join team discussions to gain and share valuable insights regarding team tasks. Yammer comes with a free trial of Yammer Basic, and is available with Office 365 paid plans. Losing your focus under piles of emails is a little too familiar situation for most of us. Fret not, as Drag helps you stay organized by converting all your emails into respective tasks. These tasks can be further managed through Kanban boards. You can also manage your team emails by creating a shared inbox. This inbox can be shared by all of your team members to take timely decisions. The tool integrates with your Google Calendar to help you stay posted about your deadlines. No offense Microsoft, but during my first week using Box, I had forgotten all about MS-Word. Working on Box showed me what it really felt like to be a constant part of a team working on a single platform. Interestingly, my boss and I would be working on the same document on Box from two different countries, and though I could not see him, His constantly moving cursor and the additions which He kept making to the document made me feel like he was right there! Box is a cloud-based file storage service tailored to help teams store, share and access files from a centralized database. And to make the experience of team collaboration even niftier, all mode of file storage and sharing can be accessed from any device sitting in any part of the world. Just a tad limitation of having internet access for it though. But not like that’s a problem nowadays, right. Set passwords to your files to keep any unwanted third party from accessing your private data. Take notes on Box Notes during meetings, discussions or simple brainstorm sessions. Box Notes are accessible and visible to everyone. Create as many documents as you can on Box, all your written and formulated work will automatically be stored on your Box account. In fact, every miniscule edit that you make, be it a spacebar hit even, Box will automatically save anything. Box offers a powerful search bar directory that helps you locate any file from a vast treasure of online documents, notes, images, PDFs, spreadsheets, presentations that pile up over time. Box integrates with a good 1000 business applications, so teams can share and transfer their work to other best team collaboration software from their centralized content network on Box. Xender is another file sharing app, that surfaced on the market 7 years ago. Since then Xender has acquired more than 700 million users worldwide. Using one of the most innovative technologies and high-performance global server network, Xender proudly proclaims and also deliver the fastest file transfer from one device to another. Xender app uses a technology called Wi-Fi Direct. The Wi-fi Direct technology enables users with Wi-Fi-connection to share files and across any device. Users can connect to more than one person at a time and share files with a number of people at the same time. Possibly one of the most popular names in cloud storage and file sharing, Google drive gives us all the right reasons to include it in our list of team collaboration tools. With more than 800 million users to bag, Google Drive is giving all other cloud storage applications a run for their money. A safe, fast, and reliable space for all your files, you don’t have to think twice before choosing Google Drive for your team collaboration. Quickly invite anyone to view and download the files to participate in useful team discussions and take timely decisions. Not only file storage, the tool also comes with powerful native applications to help you smartly deal with your daily operations. What’s more pressurizing than unmet project objectives? You’ve guessed it, unmet deadlines. Sometimes a great amount of team effort and work ethic is not enough to always bring a project to completion. After all, there’s only so much teams can watch over, govern and manage. Harvest is a web-based tool, prospering 12 years in the business of helping busy chunk of teams to track time and meet their goals on time. Harvest takes full responsibility of your time tracking needs, with smart and intelligent features that extend from reporting, to planning and assessing the health of your project. Manual time tracking options. You can either use Harvest’s digital timer to log in total hours spent on a task or create time sheets from scratch. Calculating Burnout capacities. Harvest tracks and records the total hours inserted for each employee and compares the total billable hours logged in from each member. From this comparison, it determines whether an employee is overburdened. And if it is the time bar turns red. Integrate able with a sister-app, called Forecast. Forecast, creates a roadmap of all the projects and gives a quick summary of what each team member is working on and which tasks are pending. Excellent reporting system. Each time a team member submits a report of his/her timesheet, an automatic notification is sent to the project manager for review. On the other end, project managers can send a polite reminder in case someone has forgotten to send in their reports. Convert billable hours into invoices with simple single clicks. Then share these invoices with clients and customers via email. And if a client is slacking off or has forgotten to pay your invoice, Harvest sends automatic reminders to them. Single User – $12/month Unlimited estimates and invoices. Another leader in time tracking tools. Hubstaff is a lightweight platform designed specifically for remote teams. More than 8000 remote companies now use Hubstaff for managing deadlines and keep track of multiple teams. Hubstaff time tracking functionalities ensure accurate time accountability of each employee. The application also comes with a thorough reporting system that provides actionable insights for efficient decision making. However, Hubstaff is not simply a time tracking tool. It offers a variety of features such as screen recording, automatic payrolls, GPS tracking and powerful APIs, to make team collaboration faster and more authentic. Dashboards that display all your team’s performance, each activity, total budget spent on each project and the total number of projects completed. With Hubstaff’s advanced monitoring feature, project managers can monitor how much time does each team member spend on a website. Team leads can monitor and keep track of each team member attendance with Staff Scheduling. Free Plan – Single User. Limited Features. It records the time spent on various activities by an average employee and provides analytics that help in analyzing the total time management at work. Time Doctor provides screenshots for tracking the activities. These screenshots can be taken at any time interval you specify during the working hours, ensuring minimum privacy intrusion and maximum team collaboration. Integrations with other tools like Slack, Google Apps, Jira, Asana, Freshdesk, etc. $9.99 per user/month, Free for first 14 days. If you’re looking for a simple, flexible time tracker which doesn’t put a huge dent in your budget, Toggl might be the answer. Toggl gives you the flexibility to choose basic or advanced time tracking features, pertaining to your needs. Even with the basic functions, this online team collaboration software for time tracking makes sure you get the most out of the application. With an easy to use interface and clutter-free placement of features, the application lets you smoothly navigate through the features with minimum confusion. This brings us to the end of our partisan list, with one last question still remaining. Which of these best team collaboration software will your business be put into use? Tell us in the comments below.